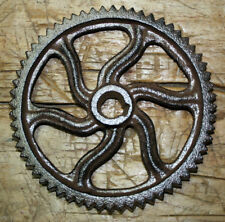 Here's a great cast iron gear / sprocket. 6" tall top to bottom, 1/2" thick. Center hole 1/2" and weighs 1.25 LBS. This is a nice set of heavy duty caster wheels. They are marked Fairbanks. Each caster weighs approx. They have ball bearings. They all swivel and roll ok. They have a hole for oiling. These have not been cleaned, but can easily be cleaned by soaking them in a degreaser over night. Cast iron table base, made by Richmond Foundry Mfg. Co. 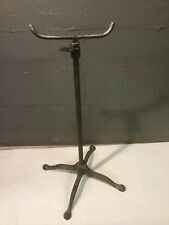 Antique Cast Iron Stand. Has glass window the top slides off to fill with beans and this beautiful piece is still in working condition. 2 great gears for steampunk projects. Each 2" tall and 3/4" thick. Center hole is 3/4" round. This scoop is in amazingly good shape for its age. -- Really Good Condition --. This is a rare Globe Tapping Machine Co. Bridgeport, Conn. cast iron sign. The sign is about 3" X 11.5". This is for one spring, there are 3 available. Things happen, if you need a couple. Estate sale find. Measurements are in the pictures. A Real Nice Antique String Holder. I bought a small collection of string holders. It is sort of bell shaped. There is a loop at the top for hanging. ANTIQUE STRING HOLDER. 5" long and 5.25" tall in good working condition. Wonderful pieces of history, found at a local (defunct) bee farm in the Yakima Valley of Washington State! These 1966 UNUSED Blue Ribbon Honey cans are in excellent condition! The colors are bold and bright, the graphics are excellent - sharp and clear, and the cans are in terrific condition inside and out, including the original lids. I do not see any identification markings on this. I do not see any cracks or breaks. THESE WHEELS ARE FOR DECORATIVE PURPOSES ONLY. Pre-owned, good condition, not written in, age toning. I think this has great potential for upcycling or repurposing. I have no idea what these were originally made for but I have made a few chandeliers and pot racks with them. They do not have any cracks or repairs. Set Of Two ANTIQUE BRASS SHOE SHINE STAND FOOTREST 15" Each Original Finish.These two shoe shine rest are a beautiful example of an era in the 🇺🇸 ! add these beauties to your collection. Up for sale is an antiqueShoe Shine Stand Foot Rest. Consider this item for your collection or use as part of Steampunk art! Single stand, not a pair. Garden Art Steampunk. Great Estate Find! Good Condition. This f r ee standing or hangingbarber pole is an authentic reproduction made of solid poplar. Every one is hand turned and hand painted. The pole easily hangs on the wall o r can be freestanding. Si ze 7 1 /2 ” th ic k x 40 ” hi gh. The glass is intact. Not tested. Sight Feed Tool Catalog Detroit Mi. Front cover is missing. Its 56 Pages Long. Overall a great item to add to your collection. Very nice antique Schrader gauge. Please see all photos and ask any questions. I cut a thin piece of ribbon and it is still pretty sharp. There is no indication of maker or origin. Part of an old seeder. Could be repurposed in a lot of ways. Weighs around 35 lb. The perfect accessory for your Steampunk or Industrial lighting project. Photo #3 shows these gears added to one of our steampunk lamp sockets (Not Included). Please look at pictures for measurements and condition. Beautiful display piece from the Machine-Age! Circa-1915, WW1 item.Untested, for display only. Hive String Holders any More. You just don't see many of these Bee. base, That is not a ball of string. string has the markings, That is old. Holder - There is a # 5 on the bottom. it is a Styrofoam ball that looks like. The two wheels weighs apr. 15 lbs. The rubber is still use able. This is an antique "The Pique" paper roller holder dispenser. It is made of wood and cast iron. You will receive all the cans and 3 original display boxes. I was not able to open any of the cans I tried to open. The loose cans show more age than the ones in the boxes. One box has a couple of tears to its lid, see last photos.